On our way back to Reykjavik on the last day of the tour, Gunnar asked if we'd like to stop and see some horses. Since everything we had seen that day was cold and very very wet, and the horses were dry and inside, the response was very enthusiastic. Icelandic horses are a very pure breed, descended from the horses brought by the early settlers a thousand years ago. They're small -- not much bigger than ponies -- but extremely strong. So although they can easily carry an adult man, human legs dangling off those little bodies can be very comical. We saw a short film and then got to wander through the stables making friends with the inhabitants. 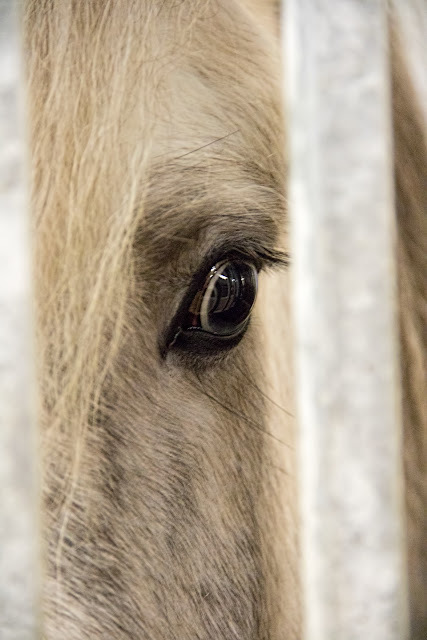 They're gentle and curious, snuffling sweet horsey breath at our outstretched hands and allowing themselves to be petted and gushed over with calm dignity.